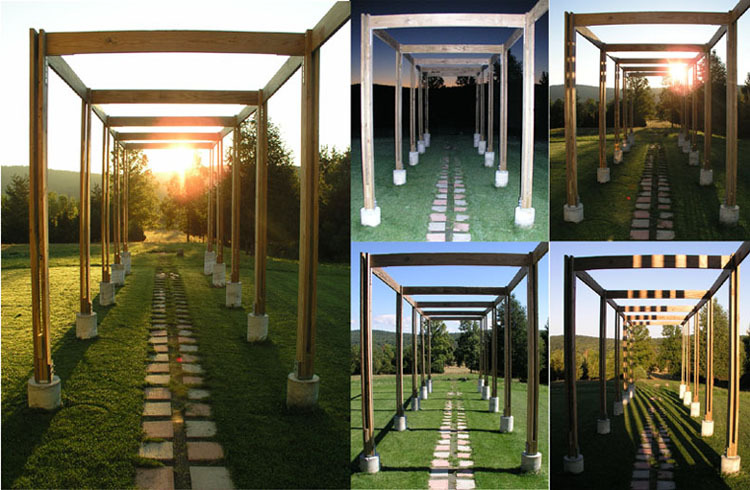 Sunrise Trellis is a structure which frames the rising of the Sun at the equinoxes. It is aligned with an East-West axis,identified by a path of pavers at center of a trellis structure. The axis originates at the midpoint of the distance between two 80' high hickory trees, some of the oldest trees in the property. Sunrise Trellis is a place that establishes awareness of our presence in space and time. Space becomes an expression of time by the interaction between light and structure: continuously changing light/shadows patterns and sky backgrounds reveal the passage of time throughout the day and the year.